Roger Rowett is the founder of Taith Ltd and a Practitioner Member of The Association for Business Psychology (ABP). Previously he has worked for a range of organisations within the voluntary, statutory and private sectors over a 30 year period. He worked as a Workforce Development Officer for the Care Council for Wales, an HMI for Estyn (Education and Training Inspectorate for Wales), and Professional Advisor for Children’s Services within the Care Standards Inspectorate for Wales (CSIW). Roger originally qualified as a teacher, going on to work as a youth and community worker for the YMCA. He spent 10 years with the YMCA managing a number of projects including an advice and counselling centre for young people and a youth training scheme. During this time Roger was highly influenced by Carl Rogers and his concept of unconditional positive regard. Roger’s work experience has mostly centred on projects which support young people and vulnerable adults. This has included coordinating a county wide forum for service users, carers and voluntary organisations. He has also worked for an Internet company and designed information management systems for a wide range of clients within local government in Wales, England and Scotland. Roger’s current work centres on organisational development and self evaluation and review. 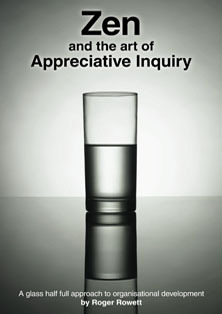 Much of his recent work involves the use of Appreciative Inquiry (AI). Roger has trained as an AI facilitator with Jane Magruder Watkins and Mette Jacobsgaard and he has published a number of articles and a book on AI. More recently he has completed a course as a Mindfulness trainer. In recent years Roger has written a number of publications for the Care Council for Wales including their guidance on Person Centred Planning and the 2016 Framework for Dementia Services (Co- author). Roger is Married with two daughters and lives in North Wales. He has studied Aikido for 25 years and enjoys table tennis, cycling and walking.